If you were to ask a European or UK motorcycle enthusiast to name the most successful series of competition motorcycles the likelihood is that they would respond with the TZ series of twins. Those with a more historical view point may mention MV fours or Norton over head cam singles but it is unlikely that any would offer the Harley Davidson vee twin, or more particularly the XR750 and yet it is a machine that can rightly lay claim to the title. The over head valve XR750 was first introduced in 1969 replacing the long line of KR side valves. Designed in response to the change in rules implemented that year which removed the capacity advantage enjoyed by the domestic side valves over their British rivals equipped with over head valve engines. The original engine retained the iron barrels of its "Sporster" cousin, unfortunately in this form the engine was prone to over heating prompting a redesign incorporating aluminium barrels for the 1972 season. This coincided with the emergence of a new set of rivals emerging from Asia. Yamaha were in the vanguard utilising their over head cam XS650 twin and were followed by Honda who applied all of their expertise. 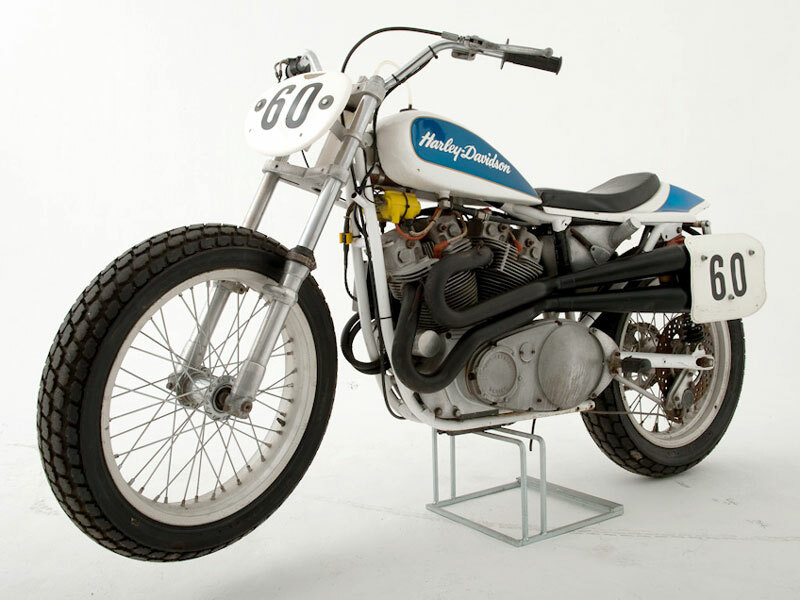 Despite some success neither manufacturer was able to break Harley Davidson and the XR750's control. It is thought that no more than approxiamtely one thousand XR750's were built in total with very few of the machines built during the seventies surviving resulting in XR's with factory history commanding prices of up to $60,000 in the land of their birth. The example offered dates from 1977 and was originally purchased by Ricky Robinson and retains its original frame. It competed on the dirt ovals during the second half of the seventies before being rebuilt by Ricky Robinson in August 1981 prior to it being bought back by the Harley Davidson factory for $4,500. The vendor has a photograph of what he believes to be the machine offered forming part of the Harley Team and understands that it was ridden either by Scott Parker, Jay Springsteen or Randy Goss. It was during this period that the machine was fitted with the Werner Tank (Bill Werner was part of the Harley Davidson factory team at the time) and Patrick engine covers together with "a host" of Mert Lawwill parts. It was subsequently sold to John Erickson in May 1982. The machine benefitted from a full engine rebuild during 2006 and has not been run since. Finished in the distinctive blue and white livery that it competed in in period it is described by the vendor as being in good cosmetic condition. It is accompanied by a bill of sale relating to its purchase by Harley Davidson in 1981, and a number of receipts.